The following was written by Donna Egge from Family Services for NPHI. 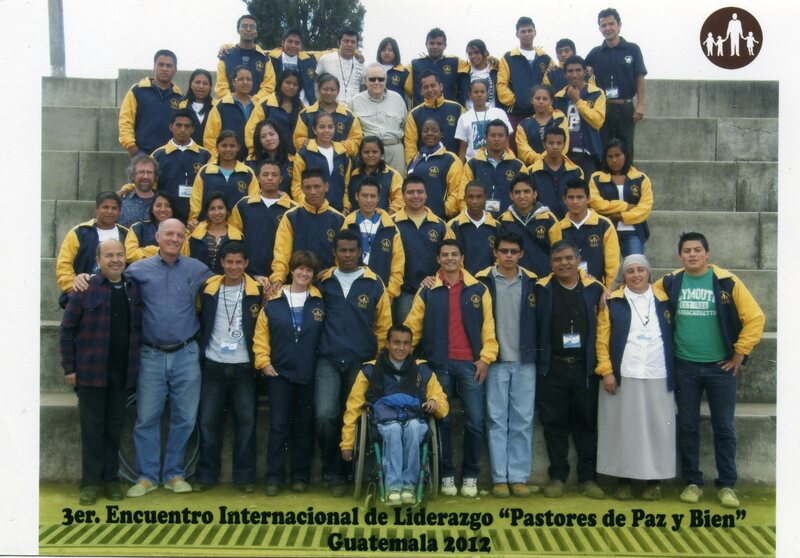 This was the third year of the NPH International Leadership workshop for young leaders from all 9 countries. The theme of the retreat was the same as the Seattle Leadership Program Retreat in December and we were able to share many ideas and plans with each other. As we begin the application process for the 2012-13 leadership program in Seattle, many of the participants from this workshop are planning to apply and we look forward to reviewing their applications! Our vision has always been to help our young people develop their strengths and potential in order to serve others in their own families and communities; this was and still is Fr. Wasson’s dream. We in the Family Service Team have many avenues to support this great vision in our ongoing work in the NPH Family. And, this past January, 43 youth and young adults from our extensive NPH family gathered in NPH Guatemala for the THIRD ANNUAL INTERNATIONAL YOUTH LEADERSHIP WORKSHOP, Pastores de Paz y Bien. These amazing young people are “brothers and sisters” from the same “family”, who happen to be raised in 9 different countries, where our NPH homes reside. To see their energy, harmony, and spirit come together in the name of Fr. Wasson, was an inspiration to us all! Our overall theme this year was “Servant Leadership.” We explored this topic in a variety of ways. Fr. Reynaldo, as one of our guest speakers, helped us to look to the bible for what Jesus says is a servant leader. Sr. Kolbe, also from NPH Honduras, spoke to us about the servant leadership qualities in Bishop Oscar Romero, Mother Teresa, St. Francis and Fr. Wasson. We washed each other’s feet and experienced humility. We broke open the Word of God and ourselves as we struggled with what being a servant leader means in our NPH homes. How are we, each one of us, called to serve our thousands of brothers and sisters each day and into the future? The youth worked in small groups on values in leadership, discovering that the values of honesty, perseverance, respect, service, understanding and responsibility are all values based in faith. They spent time learning and sharing about their own strengths and challenges and what they can work on to develop better leadership habits. How do we learn to lead and to listen when there are problems and challenges? How do we find our voices to speak up when there are injustices, in ways that we will be listened to? Who are our support people in our individual homes? These and many other questions were raised and discussed. These rich discussions were filled with a vibrant energy that gives so much hope to the future of our NPH Family! These youth ARE the future! We had our beloved Dr. Maccoby, longtime friend of Fr. Wasson and leading expert in the US on leadership, come speak to us about our philosophies of leadership. He shared with us his definition of a leader. “A leader is someone people follow”. He then inspired our youth to think about WHY do people follow these leaders? Out of fear and obedience or respect and inspiration? What kind of leaders do they follow, do they want to follow, do they want to be? We also featured a panel of leaders from our NPH homes, some of whom are Pequeños/Pequeñas themselves, and local leaders from NPH Guatemala. They spoke to the youth about their experiences of servant leadership, sharing advice and inspiration to a receptive audience. At the end of the workshop, teams from each of our homes met with the Family Service Team and developed a plan of action for their return to their home countries. What will they put into practice with their local leadership groups? What resources will they use? How will they continue teaching about Fr. Wasson and his life to their younger brothers and sisters? How will they lead with a servant heart? We shared, prayed, sang, laughed, ate, worked, learned, reflected and played together for 7 days. New friendships were formed and a new energy to serve was born. Each participant returned home with new ideas, new dreams and renewed energy to share what they had learned about servant leadership with their directors and brothers and sisters back in their respective homes. We have high hopes for the future of our young people in the NPH Family! We most assuredly know that without a doubt Fr. Wasson was looking down from heaven reveling in the joy and love present this week, filled with the knowledge that his mission of service and compassion will continue! Our workshop would not have been successful without the Comité de Apoyo from NPH Guatemala, a team of 11 youth leaders, who actually put into practice, servant leadership. They served the participants each meal, participated in our worship and other activities with the participants and were available to help our group with all of our needs during the week. We are deeply grateful to them and their developing leadership skills and to NPH Guatemala for their hospitality and service to their sisters and brothers in the NPH International Family! Little by little, day by day, we are planting seeds, and nourishing these young people so that they too will see the value in servant leadership, making a difference in their own lives as well as the lives of others! NPH Leadership Program Pilot Cohort!